In today’s Dungeons & Dragons game, player characters gain experience by overcoming obstacles and defeating monsters. In the original game, PCs got most of their experience for claiming treasure. (For more, see “The fun and realism of unrealistically awarding experience points for gold.”) Back then, if you skipped monsters and traps on your way to the loot, all the better. Of course, Gary Gygax never let players cart away gold without a challenge. His game included a few spells that allowed clever players to skip obstacles, but none that let players skip the dungeons or the dragons. As the play style of D&D grew beyond the dungeon and focused on story, designers introduced spells that let players skip past dungeons to treasure vaults or dragon hoards. More than any other class of spell, these tend to vary with edition, revealing the changing fashions of play. When designers focus on setting books and novels, they overlook the potential of Find the Path. When they seek D&D’s roots, they notice the power of walking through walls. Gary’s original game included rules for wilderness encounters, but his players preferred to explore under Castle Greyhawk. Underground, the 3rd-level spell Fly never rates above another fireball. As soon as D&D left the dungeon, Fly shaped play. Every dungeon designer toys with the idea of turning a ruined city into a sort of open-air dungeon. Then they remember that the wizard can cast Fly. Every dungeon master eventually sees flying PCs turn a carefully-prepared challenge into a joke. The PCs soar over obstacles or strafe helpless foes. Players relish their prowess; DMs never overlook Fly again. As soon as players gain access to Fly, the spell frees players from challenges they can fly past. But Fly carries a key limit: it only works on one character. This makes a spell that can both leap obstacles and create interesting complications. When just one person can scout ahead, they can fly into a heap of trouble with no help—a memorable game moment. When a spell takes an entire party, obstacles disappear. Once, the 6th-level cleric spell Find the Path focused on escape. “By means of this spell the fastest and safest way out of a trap, maze, or wilderness can be found.” In the original books, the sample tricks and traps focus on getting PCs lost in the dungeon. When Gary’s shifting rooms and unnoticed slopes made the PCs hopelessly lost, Find the Path offered a way out. Some players had the bright idea of finding a path to something like “a hoard of platinum pieces.” Second edition specifically banned looking for objects or creatures. When players stopped looting megadungeons and DMs introduced stories into their games, Find the Path gained game-breaking potential. If players aimed to capture the master of the thieves guild, the spell could take them safely to his hideout. If they needed to find the Gate of the Hidden Ways, the spell guided past any wards. By third edition, DMs were visiting message boards, pleading for ways to cope. The fifth-edition designers realized that Find the Path offered more than escape from Castle Greyhawk. The latest version no longer reveals actions to take. It promises the shortest path, but not the safest. Gary combed fantasy stories for spells to include in his game. He even added odd spells like Sticks to Snakes and Magic jar. Of course his wizards had to get Teleport. But a 5th-level ticket past every trap and monster would spoil the game, so wizards teleporting into unfamiliar locations suffered a chance to miss, perhaps fatally. As long as PCs could not safely spy on locations from a distance, Teleport’s limitations worked. Teleport seemed too hazardous for anything but going home to rest. Third edition’s designers forgot the risks of giving PCs both Teleport and a safe way to spy. They added the 5th-level Scrying spell. Unlike Clairvoyance and Clairaudience, which targeted a familiar location, Scrying could target a creature. It worked with Teleport to make villains vulnerable to the scry-buff-teleport system of ambush, also known as scry and fry. The target of the Scrying spell gets a save, but even if the spell fails, the caster can make another attempt—or just scry Igor or minion #3. The best defense against Scrying used to be a DM with the chutzpah to fudge an improbable number of saves. Fifth edition still includes both Scrying and Teleport, but the new game changes Teleport enough to spoil the combination. First, Teleport jumps from 5th level to 7th. The error-proof Greater Teleport used to be a 7th-level spell. Now it’s gone. Second, the risk of missing a carefully-studied target jumps from 6% to 24%. With those odds, infiltrating the villain’s fortress through the sewers seems like a valid strategy. Ethereal travel can threaten to take dungeons right of the game. In 1st-edition AD&D, any cleric with the 5th-level Plane Shift spell could take seven friends ethereal, allowing them to waft through the dangerous dungeon stuff and go straight for the treasure. AD&D attempted to limit the problem by populating the ethereal with tough wandering monsters and the random Ether Cyclone. Apparently that failed to deter enough adventurers because Tomb of Horrors includes this note: “Character who become astral or ethereal in the Tomb will attract a type I-IV demon 1 in 6, with a check made each round.” Second edition closed Plane Shift’s game-breaking potential by ruling that the spell “rarely works with pinpoint accuracy.” In 5E, you appear 5 to 500 miles from your intended destination. Now that Plane Shift drops PCs wherever the DM fancies, it becomes useless except as a save-or-goodbye attack. If the game requires the PCs to go to Hades, fate (the DM) will provide a way. Etherealness began as a feature of magical armor or oil, items the DM could limit. Then it became a psionic power. When DMs allowed psionics, etherealness ranked as the least of their troubles. A Guide to the Ethereal Plane opened the plane to a pair of spells. The 5th-level spell Lesser Etherealness took the caster and 3 friends ethereal for at least 4 hours. The 7th-level spell Greater Etherealness worked on 1000 pounds. Three strong, skinny friends could probably carry off more loot with the lesser spell. A party with such easy access to the ethereal could loot half the dungeons on the prime material. But as long DMs kept Planescape to planer adventures, Lesser Etherealness stayed balanced. The third-edition designers recognized these spells’ power. When they brought the renamed versions Ethereal Jaunt and Etherealness into the Players Handbook, they raised each spell by 2 levels. In fifth edition, the 7th-level spell Etherealness takes the caster to the ethereal plane, where they can waft alone into a heap of trouble. To take 2 friends, cast the spell at 8th level. At 9th, take the whole party. The 6th-level spell Forbiddance protects an area from planer travelers and teleporters. When cast 30 days in a row, Forbiddance becomes permanent. In practice, most tombs, vaults, or fortresses that interest 13th-level characters will be guarded by Forbiddance. By the time third edition came around, some designers had become so immersed in the story slant of D&D that they forgot how broken insubstantial travel could be. How else can we explain Ghostform, a spell that makes the target insubstantial? Just add invisibility to Ghostform and you can phase through any dungeon. Ghostform appeared at 5th level and rose to 8th in errata! The 3-level revision stands as a record. Fifth edition drops the spell. The fifth-edition designers studied D&D’s history, playing every edition of the game. They managed to look beyond a single play style and address the problems with a category of spells that sometimes bedeviled dungeon masters. This entry was posted in Role-playing game design, Role-playing game history and tagged Castle Greyhawk, ethereal, Gary Gygax, planes, spells, Tomb of Horrors. Bookmark the permalink. Ghostform was indeed completely ridiculous. It was a spell that clearly meant to be used the way it was, which was inherently against the plot/dungeon/adventure concept. I do think Fly gets an unfair reputation. Sure, it can be used to rain fire down from above, but I think most players understand that this just isn’t fun to do. It can be a really flexible ability (whether from race or spell or item) and a lot of fun. I’m really okay with seeing it happen more often because of the creativity it stimulates. I agree that Fly adds fun to the game. When I play a wizard, I love using Fly and other mobility spells. It’s fine as it is, but DMs need to keep Fly in mind. I’ve run published, higher-level adventures where the author clearly designed things without a thought to flight. I dislike moments in the game where players decide that their best strategy is use flight or some other advantage to slaughter helpless foes. It lacks the heroic feel that I enjoy, and sometimes pits the heroic PCs against the more unsavory PCs. I prefer to devise encounters that avoid such scenes. Re: Introduction of Scrying, you may have overlooked that the same effect is in Gygax’s 1st Ed. Unearthed Arcana (1985), in the spells Magic Font, Reflecting Pool, and Magic Mirror (each specific to a different class, but cross-reference each other). 3rd Ed. basically consolidated those blocks of text into the single Scrying spell to save space. Thanks for filling the gap! I doubted 3E would create the Scrying spell from nothing, so I searched the books for an original. Turns out I didn’t know where look. 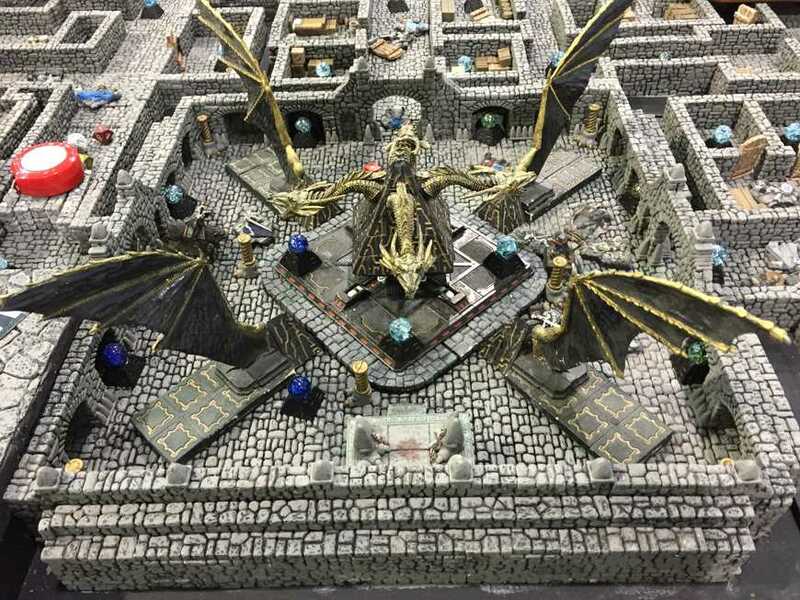 Seeking a D&D gaming group (3 or 4 players) for Nova Games, US Route 9, Freehold New Jersey, Weeknights, 1 night per week. Call 732 947-9026.